We expected this to be under wraps for a week or two more but this morning the next LEGO Ideas set, 21312 Women of NASA, was revealed on the Ideas blog, perhaps done so early because certified stores in eastern Europe have started selling them already. It’ll be available in brand stores and shop.LEGO.com on 1st November for €24.99 / $24.99. The blog also reveals that there’ll be a pre-release signing event at the New York Flatiron store on Saturday, 28th October. Maia Weinstock’s original Ideas submission proposed the inclusion of Katherine Johnson, whose work was the subject of this year’s Hidden Figures film. However she’s not present in this set because, as a company spokeperson explained to Gizmodo, “In order for us to move forward with a partner we need to obtain approval from all key people, which was not possible in this case. We naturally fully respect this decision.”. View more images and the description after the break. 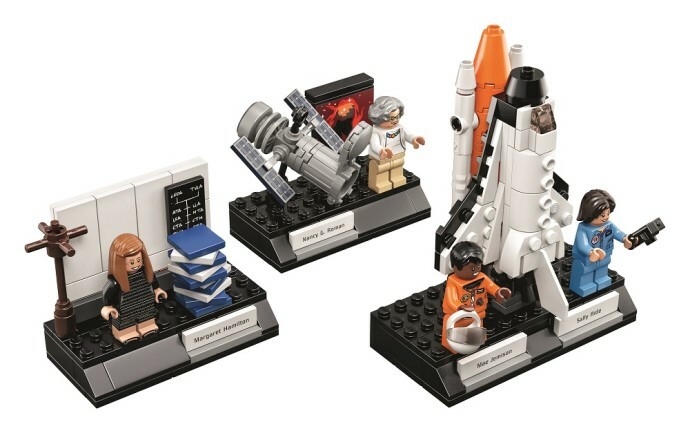 Follow in the footsteps of 4 pioneering women of NASA with this fun and inspiring LEGO set. Build the Hubble Space Telescope and learn astronomy with the ‘Mother of Hubble’ Nancy Grace Roman. Develop the software for space missions with computer scientist Margaret Hamilton. Launch the space shuttle with Sally Ride, the first American woman to fly in space, and Mae Jemison, the world’s first woman of color in space. Build, play, learn and one day you too could become a science, technology, engineering or mathematics superstar!